Seven months later, we had published 29 guest posts, including posts on major blogs such as ConversionXL, UpWork, CrazyEgg, etc. Our budget for the whole process? $3,600. Let me guide you through our process. I work for WisePops, a popup builder. I became Head of Growth 12 months ago. Before I took the position, we had zero (0!) link-building strategies. 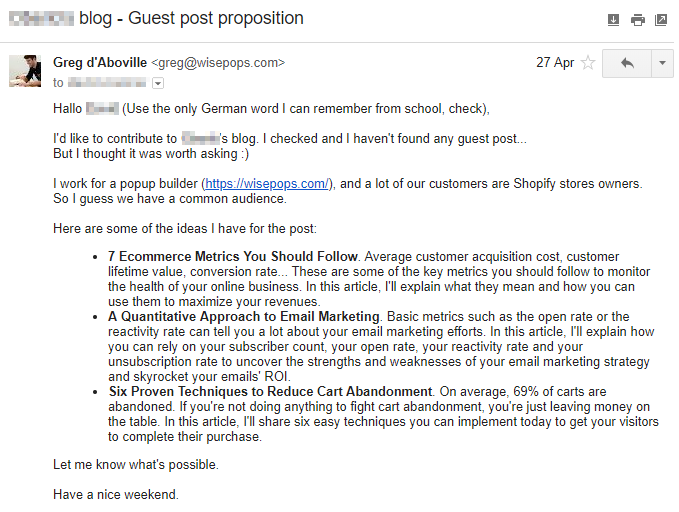 B) What is guest posting? If you don’t know what guest posts are, I recommend this article on the matter by SEO Expert Brian Dean. 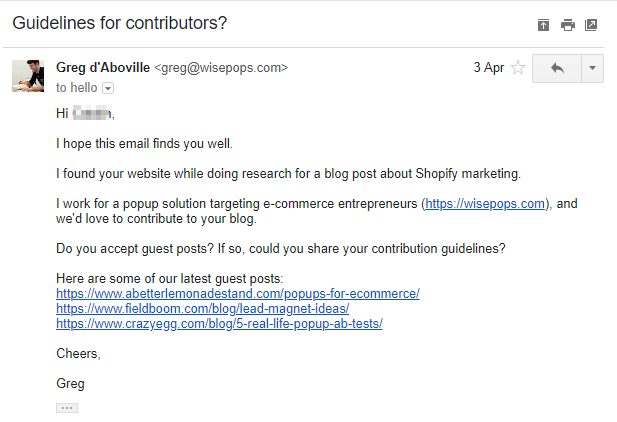 In short, guest posts are one of the options to get backlinks that Google doesn’t consider spammy. Our experience with content marketing was limited. The only content on our website was written by freelancers, with limited input on our part. We had zero experience with link building in general and guest posts in particular. Our team was small: a (very good) freelance copywriter (Pawel Grabowski) and me. I’m French. It can help to win a soccer world cup, but it doesn’t help at all when it comes to writing articles in proper English. In short, if we’ve done it, anyone can do it! Now that you know where we come from, it’s time to break down our process. In retrospect, it was an excellent decision: These partners were benevolent and helped us improve our writing skills. They prepared us for the next step: contacting people with whom we had no pre-existing relationship. I know most of my competitors focus on low-hanging fruits (blogs that accept short content); this means it shouldn’t be too hard to get the articles accepted and written. The unfortunate truth about sifting through a list of competitors’ backlinks from Majestic, Ahrefs, Moz, Linkminer, etc., is there is a lot of junk data to filter out. I recommend as a first step to exclude the links that are no-follow, spammy, not indexed in Google, duplicated across category/tag pages or from auto-generated sites. As a second step, I suggest you check the anchor text type of those links. For example, if a link has branded anchor text, it’s likely that the link is from a guest post bio link, a listicle or an expert quote. If it’s a URL anchor text, it’s probably a directory or profile link. If it’s a keyword anchor text, the likelihood of it being a paid guest post increases. Checking these details will help you prioritize your outreach list to help you accomplish your goals most effectively. Tools such as Linkio can help you automate this process (full disclosure: it’s my company). Later, I had to push landing pages related to specific platforms (such as Shopify, WordPress, etc. ), so I refined my searches. I googled “Platform blog guest post” (for example: “Shopify blog guest post”) and related queries. It got us 7 posts, but this is where my conversion rate was the lowest. One of the crucial parts of guest posting is to build a quality prospect list of site owners who will actually respond to your outreach emails & ultimately publish your guest post. It’s a make or break of your entire campaign. Where is the challenge? Guest posting has been around for a very long time. Site owners & bloggers are simply bombarded with emails, every single day. Ideally, your prospect list should have names of people who already know you in some way. Of course, that’s hard when you are just starting out. How can you overcome that? Segment your list. Break it down, based on the depth of the relationship level, and then tailor your outreach for each segment. 1st Level Connections – These could be your business or integration partners, existing or past clients. All of these guys often have blogs and will be happy to host your content. You can be more direct & friendly with your outreach. 2nd Level Connections – Aim for introductions to build trust. When searching for influencers in your circles, use LinkedIn; aim for the ones in the 2nd level connections. Oftentimes, you might know somebody that knows your prospect. Get introduced first, and then talk about your guest post. 3rd Level – No Connection – These are the hardest ones. Most of your prospects won’t be connected with you. Yet. Try engaging with them first, before emailing about your guest post. Comment on their site. Engage with them on Social; Email them to say hi. Be around, before striking with your guest post. Bonus Tip: We are using various prebuild blogger & influencer databases to source & build our outreach list of prospects. It’s a great way to get instant access to millions of bloggers. There are many great platforms available out there with solid data & filtering functionality to make sure you find the right prospects for your outreach. Bonus Tip 2: There is one other thing we do when building an outreach list. We are going broader. So, not just looking for prospects in one niche. We are also looking for prospects in what’s called shoulder niches. What’s that? “[A Shoulder Niche is] a niche that is closely related to your sites’ main topic.“ – Brian Dean (Backlinko). That way we can get a larger pool of outreach prospects & get better results for our clients. At the end of the process, we had a list of 463 potential websites to contact. We narrowed it down to 123 websites using the following filters. I visited all the websites and checked if the links in the guest posts were dofollow (reminder: a nofollow link has no SEO value). For example, Buffer’s blog is great. But we have practically nothing to do with social media… I also removed the websites that published low-quality posts (less than 600 words, poorly written, etc.) to make sure our links would be in good company. I then ordered my list to prioritize the easiest targets with the highest trust flow. Let’s start with a quick note about a mistake we made at the beginning. We thought we could ask writers to both reach out to potential blogs and write articles for us. That turned out to be a bad option. We contacted a few writers who refused and hired one who let us down. Now, let’s detail our final outreach process. If you accept guest posts on your blog, you may know it can be a traumatic experience. Seriously. You’re swamped with automatic emails based on the same outreach templates with limited if no personalization and/or totally irrelevant content. We decided to take an opposite direction and send targeted, personal, relevant emails to reach a decent conversion rate. Finding the correct contact info can take some time. Fortunately, there are a few options available. We used either Clearbit’s Chrome extension or Hunter to find the contact’s email. 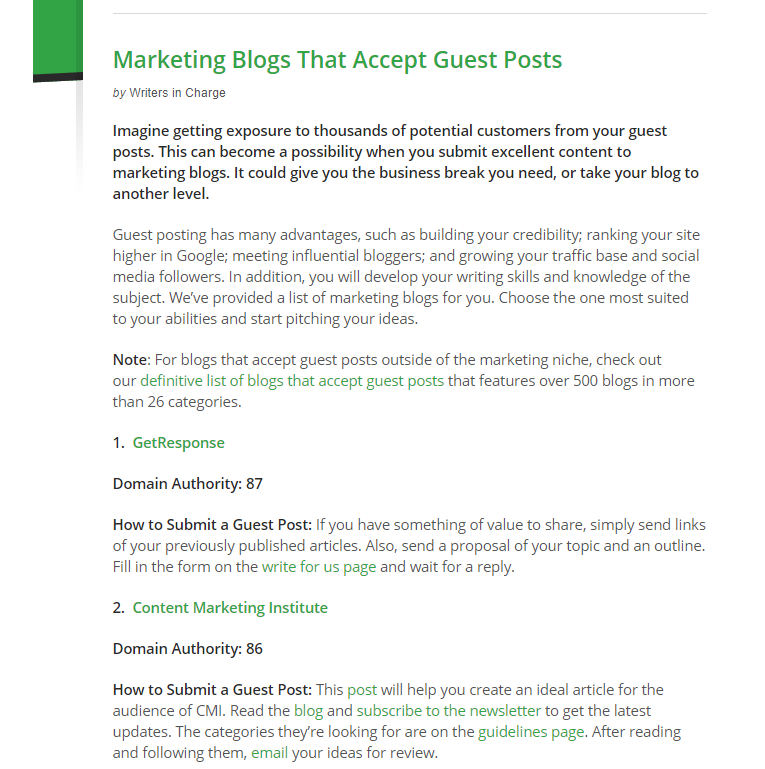 Before starting your guest posting strategy, make sure you have published a wide variety of content on your own blog. There’s nothing worse than securing a guest post opportunity and finding that they’ll only accept content related to a topic you don’t have a natural link placement for. It will make you free to pitch topics that fit well with the blogs you are guest posting for without sacrificing specific, natural link opportunities. Regarding the outreach itself: Two essential elements of reaching out is to follow up and to find a second contact at a company if the first one ignores you. I’d say at least half of the guest posts I’ve secured have come after my second follow up, and another quarter has come from me reaching out to the director of marketing after the content marketing manager ignored my emails (directives coming from up top always get done). Never give up after one email, and never give up after one contact. We noticed that most freelance writers write about topics they superficially know. As a result, most guest posts are well written enough to inspire curiosity. But usually, I find their content lacks real-life experience and data. To make a difference, we decided to focus only on topics where our team had significant and first-hand experience. As a result, we wrote mostly about what we know best: website popups. 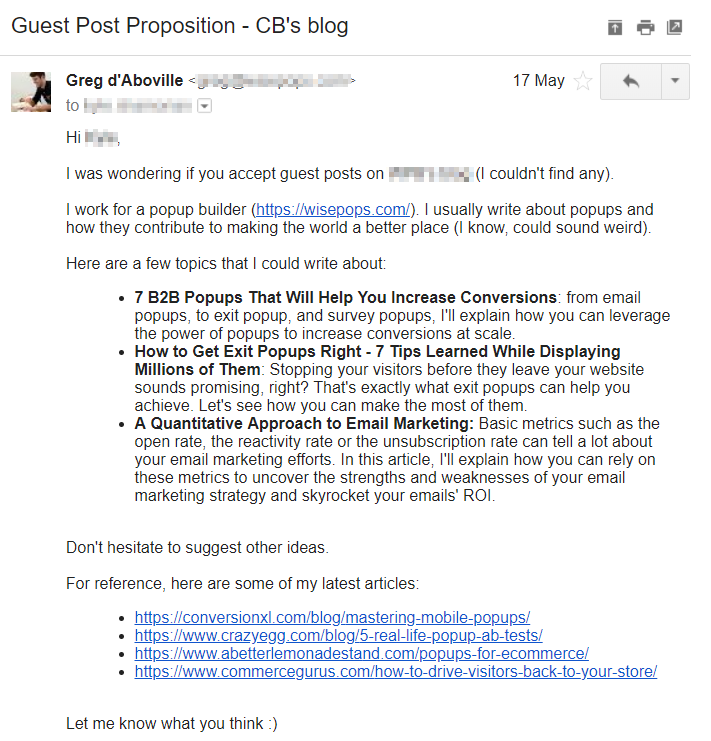 Twenty of the 29 posts we published were about popups. In each of the posts, we chose a different angle, though, and included exclusive data and examples (that was not easy!). Pro tip from Josh Brown, Content Strategist, Sales & Orders. Writing about topics you master is crucial, especially if you’re using guest posts as part of your SEO strategy. Because you want your guest post to be a linkable asset –the idea being that the more links going to the guest post, the more link equity it passes back. While you can certainly write guest posts on topics that you don’t have intimate knowledge of for sites with authoritative domains, you’ll only end up scratching the surface of the potential SEO benefits. By creating content that utilizes data and knowledge from real-life experience to provide actionable advice, it becomes much easier to overcome potential content shock and create an article that people actually read, share, and link to. If you don’t have intimate knowledge on a topic that you’re writing a guest post on then I suggest reaching out for quotes from people who have that experience and therefore can provide that knowledge. Not only will that help with making your guest post more authoritative, but it begins the relationship building process with people who can help share your post. Do I feel like I’ll be able to meet the writing standards of the destination blog without help? Do I have the time to write the post at this specific moment? In the end, I wrote 21 of the articles myself, and Pawel wrote the others. When Pawel wrote the articles, I shared as much data and examples as I could, and we validated the structure and final result together. Of course, what’s the point of all this work if it doesn’t bear fruit? Let’s detail how these posts impacted our rankings and traffic. 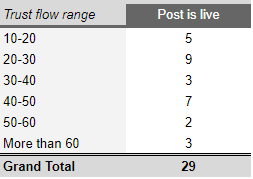 Here’s the breakdown of the posts we placed. And here’s the impact on our Domain Authority: It went from 28 to 37! Important note for our link profile as well: Our spam score remained unchanged. This part was disappointing. Our 29 guest posts have only generated 393 unique direct visits. Most blogs give limited visibility to contributors. Most of the time, we only got a signature at the end of the article and a link in the body. Our priority was to place links that fitted naturally into the article, not to promote our brand. I didn’t do much to promote the articles. Target blogs with larger audiences (lots of comments and large email lists) – Specifically sites that don’t publish content more than once a week. And don’t have several CTA’s getting in the way of your author bio. Take a keyword focused approach to your guest posts – target high-value keywords, optimize the content, and promote the article in other guest posts. Consider providing the blogger with a list of recommended internal links (links + varied anchor text). You’ll both end up with more traffic if you can work together to rank the article. Involve influencers in every guest post – An easy way to do this is to do an expert roundup-style post. But, a better approach is to ask influencers for a quote that you can add to an original article like Greg has done with this post. You’ll get more shares & links as a result. Level up your content – the more detailed, useful and engaging your content is, the better it will perform. Listicle styled content works especially well – the bigger the number of points included, the better. #1: Climbing the guest blogging ladder — Start off on smaller blogs, then aim for more established sites each time, until you get to ‘prestige’ status. Why? Links from hugely popular websites will be much more valuable in terms of traffic and link authority (which is both cost and time-efficient). Similar to relationships — Once you’ve reached this point of recognition, it lasts. Your initial work pays future dividends as you create an attractive blogging portfolio. #2: Spending 20% on content creation, 80% on distribution — Yes, ensure your material is amazing! No doubt about it… But your content won’t magically get seen by thousands if you don’t bother promoting it everywhere, no matter how great it is. This is a two-pronged method of maximizing results; traffic and link authority to your guest blogs increases (so the publishing sites are happy, too) and your own visibility receives an ongoing boost. A lot of blogs are open to guest posts. Even if you don’t find any guest posts on their blog, it’s worth trying. The impact of guest posts on rankings is obvious, and given their cost, I’d recommend it to any person trying to climb up Google’s rankings. The impact on direct traffic is limited, but this was not unexpected. Any experience with link building or guest posts? Feel free to share it in the comments!